Andrew Gillum rode a late surge of African-American voters to an upset victory in the Democratic primary Tuesday and an historic opportunity to become the first black governor in Florida history. The Associated Press called the race for Gillum shortly after 9 p.m. Tuesday with Gillum holding a two-point lead over Gwen Graham that amounted to about 25,000 votes. Gillum was beating Graham by about a 2-to-1 margin in Miami-Dade and Broward counties. The outcome delighted a raucous crowd that gathered in Tallahassee to celebrate Gillum’s victory. His victory gives Florida voters a striking contrast in both style and substance with his Republican opponent, U.S. Rep. Ron DeSantis, who has the enthusiastic support of Donald Trump. Gillum languished in the polls for most of the campaign but gained momentum in the final two weeks in a “Bring it Home” tour across the state. He was helped by a show of support from Vermont Sen. Bernie Sanders, one of several national celebrities who endorsed him, along with actress Jane Fonda, TV producer Norman Lear and former NBA star Grant Hill. A Miami native and former student government leader at Florida A&M University, Gillum was named one of “14 young Democrats to watch” by The New York Times two years ago. At 39, Gillum was by far the youngest candidate in the crowded field, but the most experienced in public office. He was elected to the Tallahassee City Commission at age 23 and became mayor four years ago. ALEXANDRIA, Va. — The Northrop Grumman Foundation and the National Society of Black Engineers (NSBE) have launched a three-year, $2-million program designed to expand the nation’s engineering workforce through a partnership with Historically Black Colleges and Universities (HBCUs). The Northrop Grumman Corporation/NSBE Integrated Pipeline Program will provide 72 engineering students with $8,000 scholarship grants, internships with Northrop Grumman and year-round academic and professional development support. The program’s three HBCU partners — Florida A&M University, Howard University and North Carolina A&T State University — will receive grants, technical assistance and a package of programs researched and managed by NSBE, to increase their already high capacity to recruit, retain and graduate engineers. 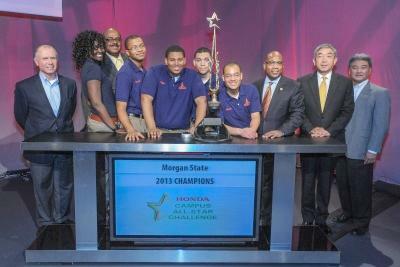 NSBE is one of the largest student-governed professional societies based in the United States. Meadowlark Lemon, whose halfcourt hook shots, no-look behind-the-back passes and vivid clowning were marquee features of the feel-good traveling basketball show known as the Harlem Globetrotters for nearly a quarter-century, died on Sunday in Scottsdale, Ariz. He was 83. His death was confirmed by his wife, Cynthia Lemon, who did not specify the cause. A gifted athlete with an entertainer’s hunger for the spotlight, Lemon, who dreamed of playing for the Globetrotters as a boy in North Carolina, joined the team in 1954, not long after leaving the Army. Within a few years, he had assumed the central role of showman, taking over from the Trotters’ long-reigning clown prince Reece Tatum, whom everyone called Goose. Tatum, who had left the team around the time Lemon joined it, was a superb ballplayer whose on-court gags — or reams, as the players called them — had established the team’s reputation for laugh-inducing wizardry at a championship level. This was a time when the Trotters were known for more than their comedy routines and basketball legerdemain; they were also recognized as a formidable competitive team. Their victory over the Minneapolis Lakers in 1948 was instrumental in integrating the National Basketball Association, and a decade later their owner, Abe Saperstein, signed a 7-footer out of the University of Kansas to a one-year contract before he was eligible for the N.B.A. : Wilt Chamberlain. By then, Lemon, who was 6 feet 3 inches tall and slender, was the team’s leading light, such a star that he played center while Chamberlain played guard. Lemon was a slick ballhandler and a virtuoso passer, and he specialized in the long-distance hook, a trick shot he made with remarkable regularity. But it was his charisma and comic bravado that made him perhaps the most famous Globetrotter. For 22 years, until he left the team in 1978, Lemon was the Trotters’ ringmaster, directing their basketball circus from the pivot. He imitated Tatum’s reams, including spying on the opposition’s huddle, and added his own. He threatened referees or fans with a bucket that like as not was filled with confetti instead of water. He dribbled above his head and walked with exaggerated steps. He mimicked a hitter in the batter’s box and, with teammates, pantomimed a baseball game. And both to torment the opposing team — as time went on, it was often a hired squad of foils — and to amuse the appreciative spectators, he smiled and laughed and teased and chattered; like Tatum, he talked most of the time he was on the court. Through it all, Lemon became “an American institution like the Washington Monument or the Statue of Liberty” whose “uniform will one day hang in the Smithsonian right next to Lindbergh’s airplane,” as the Los Angeles Times columnist Jim Murray once described him. Significantly, Lemon’s time with the Globetrotters paralleled the rise of the N.B.A. When he joined the team, the Globetrotters were still better known than the Knicks and the Boston Celtics and played for bigger crowds than they did. When he left, Larry Bird and Magic Johnson were about to enter the N.B.A. and propel it to worldwide popularity. In between, the league became thoroughly accommodating to black players, competing with the Globetrotters for their services and eventually usurping the Trotters as the most viable employer of top black basketball talent.